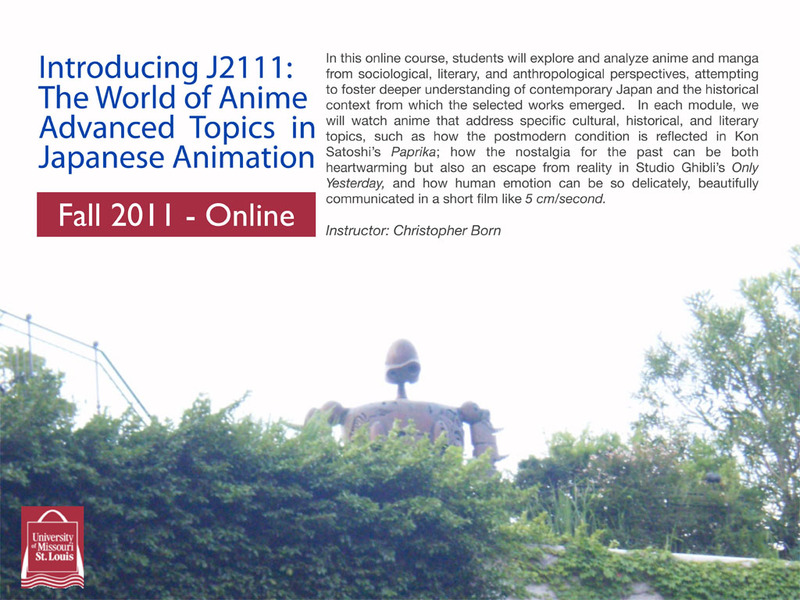 New Online Anime Course at UMSL – This Fall! Hot on the heels of the Summer J-Pop course we are offering at Wash U, I am also designing a new Anime class at the University of Missouri, St. Louis, being offered for the first time this fall. You don’t have to be an UMSL student to take it! Students will explore and analyze anime and manga from sociological, literary, and anthropological perspectives, attempting to foster deeper understanding of contemporary Japan and the historical context from which the selected works emerged. In each module, we will watch anime that address specific cultural, historical, and literary topics, such as how the postmodern condition is reflected in Kon Satoshi’s Paprika; how the nostalgia for the past can be both heartwarming but also an escape from reality in Only Yesterday, and how human emotion can be so delicately, beautifully communicated in a 30 minute film like 5 cm/second. For some modules, there will be guided slideshows illustrated with clips from feature-length anime; in other modules students will watch anime after reading critical pieces and give an account of their own assessment of what they saw in the context of what they have learned. Students will engage in threaded discussions, turn in short assignments, and write a 5-7 page paper at the end of the course. I'm a visiting professor at Bowdoin College. I teach, write, and discuss Japanese popular culture, language, literature and other topics on East Asia. I would love to take a course such as this. However, the only reason I shyed away from it and chose Psychology insted is because I just couldn’t see a sustainable future in persuing my passion. How does one sign up for this course? I’d love to sign my daughter up for it but can’t quite figure out how to do it when looking at their website! I am regular reader, how are you everybody? This post posted at this web page is really fastidious. This is such a beautiful website, and I would have loved to take that course. I am having trouble with the quizzes. Once I completed the quizzes for module 5,9, 11, 6, 8, and 12 I could not see which answers I got correct or what I got wrong. That has not been the case for all the other quizzes. I could normally see what mistakes I made and study from my mistakes before I retook it. By learning from my mistakes I was able to do better on the retakes. Now I don’t know what I am doing wrong or what I am doing right. I do not know what I need to learn. So I tried retaking these quizzes without seeing the results, but it caused me to receive poor grades. I retook quiz 12 and quiz 7 and did poorly on them. I wasn’t sure if you did this on purpose or on accident because when I took my last quizzes of the day I could see my results again. I did much better on those than I did on the other two. I was wondering If I could retake quiz 12 and 7 and see my results on 5,9,11,6,8, and 12 so that I can learn from my mistakes and improve my score. O. B Fatoki on New Online Anime Course at UMSL – This Fall! Brijesha Uma Nahuel Coombs on New Online Anime Course at UMSL – This Fall! "To know what is right and not do it shows lack of courage."